Archaeologists digging on an island off the UK coast have been left mystified by the discovery of a porpoise seemingly buried in its own grave on the site of a monks’ medieval retreat. The animal, which is thought to date back to the 14th century, was discovered on the island of Chapelle Dom Hue, west of Guernsey, one of the Channel Islands between Britain and northern France. "It's very peculiar, I don't know what to make of it," archaeologist Philip de Jersey from Oxford University told The Guardian. "Why go to the trouble of burying a porpoise in what looks like a grave? It’s a wonderful surprise." Archaeologists had thought the grave, which showed signs of being carefully cut, would hold human remains. Instead they found not only the skull and fin bones of the juvenile marine mammal, but also pottery shards, stone tools and the remains of a wall thought to have once been part of a monks’ religious retreat. Research suggests that porpoises were eaten during medieval times, but the internment of the remains has shocked researchers who noticed that they were laid from east to west, as per the Christian tradition. They also thought that, rather than bury the animal, the body could have been dumped in the sea just 10 meters (32ft) from the burial site. 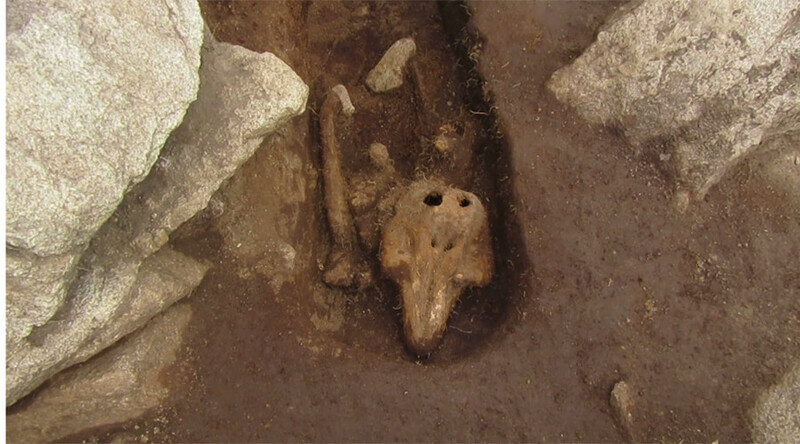 The quality of the soil indicated that the porpoise was buried at the same time as the rest of the dig area and, despite having two rat holes in the top of its skull, the skeleton is well preserved. “If they had eaten it or killed it for the blubber, why take the trouble to bury it? Some effort was made to create a neat hole,” de Jersey said. The remains of the porpoise have been removed and will now be studied by marine experts.